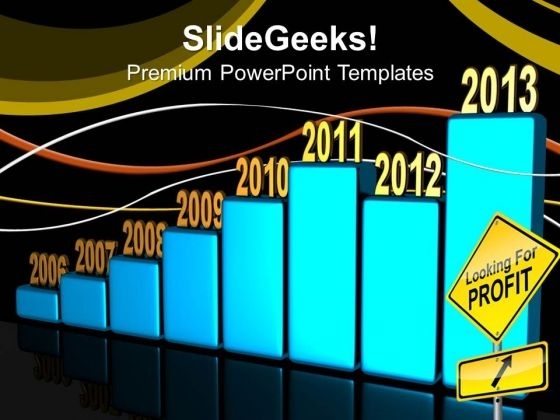 Increase In Profit Business PowerPoint Templates And PowerPoint Themes 1012-Use this template containing a blue bar graph with years in staircase manner showing increase in profits yearly to highlight the key issues of your presentation. The development in business is due to working in team and leadership. This image has been conceived to enable you to emphatically communicate your ideas in your Business and Teamwork PPT presentations. Create captivating presentations to deliver comparative and weighted arguments.-Increase In Profit Business PowerPoint Templates And PowerPoint Themes 1012-This PowerPoint template can be used for presentations relating to-"Chart graph profit increase, finance, success, marketing, business, communication" Be bold and dramatic with our Increase In Profit Business PowerPoint Templates And PowerPoint Themes 1012. State the facts with elan. Knit a great story with our Increase In Profit Business PowerPoint Templates And PowerPoint Themes 1012. Make sure your presentation gets the attention it deserves.